MOF, you can tsk, tsk me all you want...still can't make it work. Reloaded with the latest download, added TC65 to the #56 car and...same thing. Gets to the last step before opening the race and the arrow mouse pointer just flashes, no car. ?? 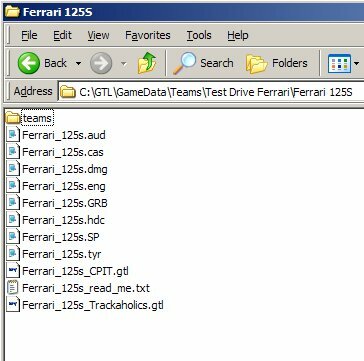 Please note the path; x-drive\GTL\GameData\Teams\Test Drive Ferrari\Ferrari 125S\teams. Yours should look like this. For larger image if necessary, right-click on image and choose 'View Image'. Once you get the mod working, then you can possibly modify it further, but I doubt it. 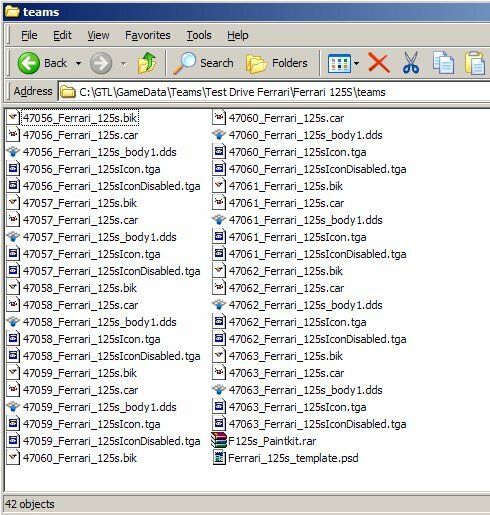 Yeah, my Teams folder looks like that, but how come no OBJ, TEX or WHEELS.GTL files? I figured the Trackaholics file was probly something like that. Yeah, my 125S file looks like that too...still don't work. Thanks to everyone involved with this, it looks good. However, I'm wondering if anybody can help me as I'm having trouble getting anything to show at all in the game! My 'Teams' folders etc. are indentical to the two screenshots MOF's posted on the previous page. I've tried adding SIM_TC65 to the .CAR files, but nothing is showing still. Apologies, my error, I put SIM_TC-65 in the .CAR file, not SIM_TC65! It now works fine, super and thanks again!